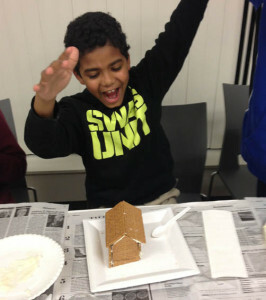 Ch ildren from Charlesview Residences Build Gingerbread Houses with the Boston College PULSE Program Students. 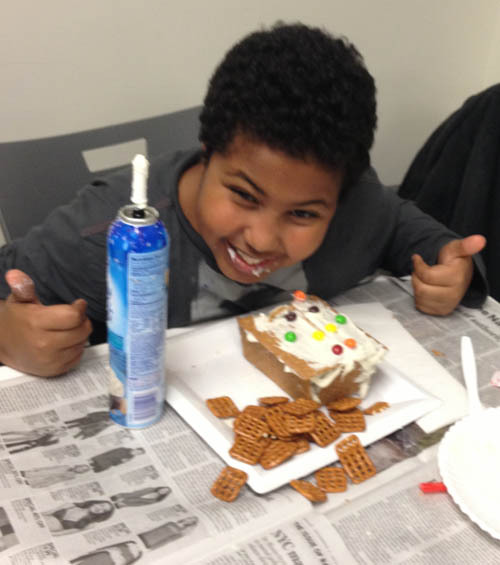 A group of twenty-five youth residents from Charlesview Residences – a recently teamed up with students from Boston College to create festive gingerbread houses as part of a special holiday project. The gingerbread workshop was part of an on-going partnership between Charlesview Residences and the Boston College PULSE Program. Each week, 11 students from the program visit Charlesview Residences and assist the children, ages six to 15, with homework assignments, piano lessons, and Spanish tutoring. 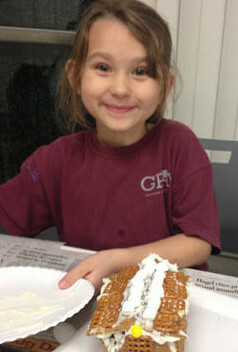 The students also lead special projects and activities and facilitate interactive games and outdoor sports. Pictured here are Amal El Youssfi, Muhammad Asim and Mujadid Elamin making their gingerbread houses.